Swimming with bottlenose dolphins is an experience like no other. The Dolphin Swim tour at Dolphin Discovery Tortola-St. Thomas will give you the opportunity to swim and interact with one of the 14 bottlenose dolphins that call the dolphin sanctuary home. When you are on vacation in the British Virgin Islands, one ideal way to enjoy yourself is to partake in a swim experience with dolphins. If you are interested in swimming with the majestic marine creatures, the Dolphin Swim at Dolphin Discovery Tortola can provide you with an amazing experience. The Dolphin Discovery Tortola is a dolphin sanctuary that is home to 14 friendly bottlenose dolphins that are ready to spend time with you. When you swim with the bottlenose dolphins at the Dolphin Discovery, you can enjoy interacting with the marine mammals in the beautiful waters of the Caribbean Sea. There are several interactive programs offered at Dolphin Discovery Tortola. The Dolphin Swim Adventure is unique in that it provides guests with the rare chance to receive a kiss, hug, and handshake from one of the dolphins. When you participate in the Dolphin Swim Adventure, you also have the opportunity to get a belly ride from one of the bottlenose dolphins, which is a unique experience where a dolphin will swim through the water backwards while you hold tight to its fins. 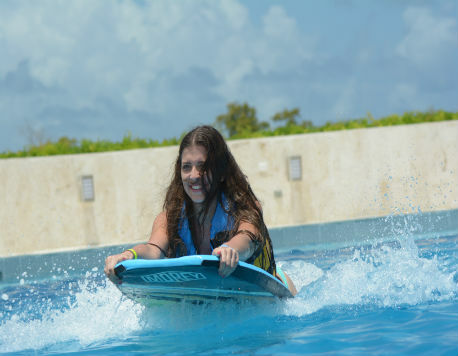 You can also experience the boogie push during your time in the water with the bottlenose dolphins. Aside from your interaction with the dolphins, the price also includes a boxed lunch and round-trip ferry transportation from St. John to West End Tortola. However, once you arrive at West End Tortola, you will need to find transportation to the Dolphin Discovery. Be sure to arrive at the Dolphin Discovery at least 30 minutes before your swim begins, which will provide you with enough time for the briefing that is required before you begin. Pregnant women are not permitted to participate in the Dolphin Swim, and children who participate in the Dolphin Swim must be accompanied by an adult. For more details on requirements for participation, please contact us via telephone or email.